Grieving can be very lonely in a society where even close friends seem afraid of getting too close and others even avoid us for fear of saying the wrong thing. This is why we think it is so important to get together during the year. When we have a friends and family event everyone knows that they are either there because someone close to them has died or because they have been thinking about their own deaths and so pre-booked a plot. This brings us all closer and makes it easier just to be ourselves. If when we are planting trees it brings on a tear of two, no problem, someone will lend you a hanky, if we have a good laugh serving out the tea at the Open Day no-one is going to think that strange either. We can have a chat and find we have a lot in common and even arrange to meet up or we can simply be present and keep to ourselves and do what we have come to do in the company of family or close friends. The choice is yours. 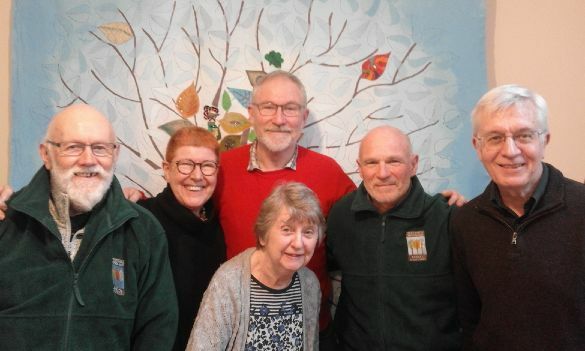 The group has a committee and it is there to help with events, channel suggestions through to the Directors and Manager of the burial ground and sometimes people also help with funerals. How much you get involved is up to you. Every year the Annual General Meeting is a chance to meet up, do some work on site in the morning, share a delicious lunch and then review the year that has gone and the year ahead. We do take a few people into the group who do not have anyone buried here but they must prove a genuine interest in the work that we are doing here and not have anything to gain financially from coming along. Ann Layt-Williams, Brian Layt-Williams, Ian Craigan - chair, David Birley - Secretary, Dave Richardson, Front Centre Ann Durnell.